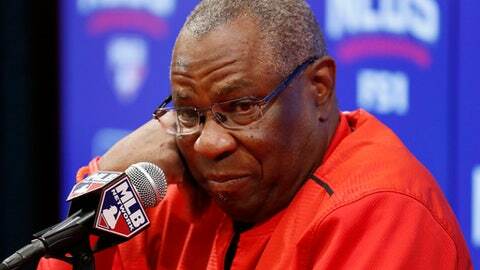 WEST PALM BEACH, Fla. (AP) Like most Dusty Baker stories, this one starts a long time ago and involves Hank Aaron. In the spring of 1967, Baker attended a week of minor league camp for the Atlanta Braves in West Palm Beach. Baker left college to join the Braves, who were anchored by Aaron. Baker went back to school, then to the military, before again joining the Braves as a 19-year-old; that team held spring training in West Palm Beach until 1997. Back in West Palm Beach as the 67-year-old manager of the Washington Nationals – who began reporting to camp on Tuesday – Baker laughed at the memories of a skinny teenager who went fishing each night in the local canals with Aaron and others. ”It’s sort of walking back through time and in your life,” Baker said. The construction workers around the Nationals’ new shared complex – they are on the right; the Houston Astros on the left – are trying to slow time. The Ballpark of the Palm Beaches, a $148 million development project that will be paid for by the teams, taxes, Palm Beach County and the state of Florida, is flooded with people try to get it ready. ”Danger” signs hung on doors. Workers zoomed around with hard hats on. A front-end loader rumbled into the complex’s entrance in between trucks on the day pitchers and catchers reported. The work is moving swiftly. Just two days ago, there was no carpet in the Nationals’ expansive clubhouse. The flat-screen televisions that surround a circular structure hanging from the ceiling – complete with baseball seams and a large, lit Nationals curly ”W” – still have their energy guide ratings stuck to them. Baker said he no longer knows his way around town. He also did not know his way around the complex yet. Which, for the second consecutive spring training, leaves him filled with questions and surrounded by newness. Last season, he was Washington’s loquacious fresh hire, sent to take a team that had regular-season success and get it through multiple playoff rounds. He knew few players when he arrived at the Nationals’ former spring training home in Viera. His staff was new. Everything, other than the mechanics of baseball, was also new to him. Baker knows the roster now. He’ll learn the complex along with everyone else. But this year, he is in search of a closer and another contract. Washington did not re-sign closer Mark Melancon, who instead joined the San Francisco Giants as a free agent. The Nationals say several in-house options are viable for that ninth-inning job. Baker also knows things change during the course of the spring. The Nationals are protective of effective reliever Shawn Kelley, who has had two Tommy John surgeries. Koda Glover is young and struggled at times last season, when he dealt with a hip injury. Recent signee Joe Nathan is 42 and had his second Tommy John surgery in 2015. Blake Treinen is another candidate. Baker is entering the final year of his two-year contract with the club. He seems unmoved by the circumstance following 50 years in professional baseball. He laughed at the thought. Baker will skip worrying and instead again focus on the things he came to do in West Palm Beach half a century ago: fish and play baseball.